View current openings online by going to the company’s main careers website. The Times Supermarkets job application can be downloaded by pressing the button/link at the top of this page. 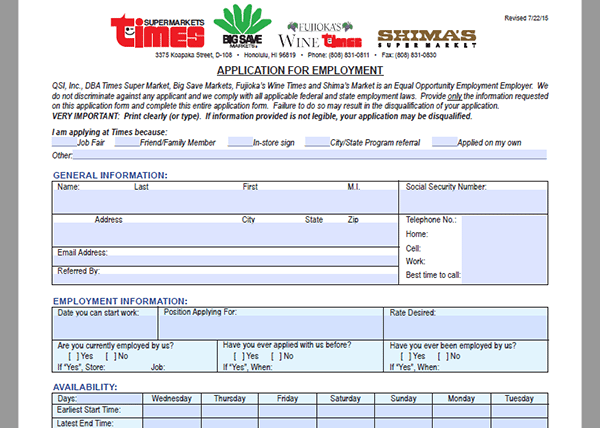 Once the form has been downloaded/fill out you must submit it in person at the store that you want to apply to. The links posted on this page will take you to the careers page (to search for current openings in your area). Read the instructions posted in the how-to guide below to learn how to properly complete the company’s application process. About the Company: Times Supermarkets is an American chain of supermarkets based out of Honolulu, Hawaii. The company was created in 1949 and operates over 20 locations throughout the State of Hawaii. Step 1 – The first step of the application process is to download the form. Click the button/link near the top of this page to download the document in .PDF format. Step 2 – Once the form has been downloaded you can either print it out and fill it in by hand, or use a .PDF editing program to fill it in on your computer. Are you currently employed by us? Which areas of Oahu are you willing to work? Which areas on other islands are you willing to work? Step 6 – Fill in the required details for all of the remaining sections of the document.